In an alleged suicide pact, a family of four set itself on fire in Rohini in North-West Delhi, reportedly due to financial problems. A Delhi court today deferred the hearing on the bail plea of suspended BJP MP Babubhai Katara in the human trafficking case for June 12 as the Delhi Police sought him to file their reply. Raising objections to the contents of the current Delhi university prospectus, volunteers of the INSO have stated that students are facing numerous difficulties with the admission process at Delhi University as there was no clear information about different colleges where newly introduced courses are available. The Democratic Teachers' Front (DTF) has taken an exception to the recent communication of the Delhi government to the colleges financed by it that they should immediately seek NAAC accreditation or else they would not be entitled to the second instalment. Resident welfare associations (RWAs) in the Capital have strongly condemned the increase in the fares of buses, autorickshaws and taxis coupled with fuel prices. They demanded immediate withdrawal of the hike as it was going to hit Delhiites hard, who were already reeling under increased prices of essential goods. Delhi Urban Development and Public Works Minister A. K. Walia has expressed deep concern over the present pace of work relating to desilting of drains by the MCD. As many as 19 bonded child labourers were rescued from half a dozen plastic factories situated in Narela area in a joint raid conducted by the labour department of Delhi government and an NGO Bachapan Bachao Abdolan here today. The Delhi government has decided to grant ration money allowance Rs 722 per month to the non-gazetted staff of the Delhi Jails cadre i.e. warden, matron, head matron and assistant superintendent. Two women, including a 31-year-old French national, sustained severe burn injuries in a major fire at a hotel in Chittaranjan Park of South Delhi. The Delhi Pradesh Nationalist Congress Party president Ramvir Singh Bidhuri today declared he would sit on "peaceful dharna" at Raj Ghat tomorrow in protest against the "state terror unleashed" by the police in Delhi, Haryana, Uttar Pradesh and Rajasthan against Gujjars. The Gurgaon administration, particularly the police department, has acted partially while following the direction of the Supreme Court for taking action against the protesters who destroyed public property and harassed thousands of commuters by blocking roads during the recent Gujjar movement for demanding ST status. Aant Ram Tawar of the INLD and his party colleagues leave court premises after being granted bail in Gurgaon on Friday. Twelve persons, including two women, were killed and 30 others seriously injured when a bus of the Uttar Pradesh State Road Transport Corporation hit a tree in Hafizpur on the Hapur-Bulandshahar road, about 40 km from here, this morning. The power woes of the residents of Haryana are likely to start subsiding from April next year with the availability of another 900 MW of electricity from various sources, Ved Prakash Vidrohi, spokesperson of the Haryana Pradesh Congress Committee (HPCC) claimed today. Forests in the National Capital Territory of Delhi are likely to become denser as the Delhi government is planning to undertake a plantation drive to bring wasteland and unused government land under the green cover. The patience of the people over the issue of water and power supply seems to be fast diminishing. Residents of Chandhut village of Palwal subdivision blocked traffic on the Palwal-Aligarh road today in protest against the short supply of power and water. Residents of posh DLF City area continue to reel under erratic supply of power and water to the extent that a good number of them feel that their purpose of setting up home here for a decent living condition have categorically been belied. While Lokpal (53), the head of the family, succumbed to his injuries at Ambedkar Hospital, his wife Krishna (50) and daughters Vibha (24) and Rachna (21) have been admitted to Jaipur Golden Hospital with severe burn injuries, said a senior police official. Lokpal first doused himself with kerosene and then poured it on others in his family before setting them on fire at his Sector 2, Rohini, residence last night. While Lokpal, who works in a private firm, died soon after being admitted to Ambedkar Hospital, his wife sustained 90 per cent burn injuries and daughters 20 per cent. The condition of his wife is said to be serious. Lokpal was facing a severe financial crisis and was troubled for some time, the official added. A 43-year-old gemologist allegedly committed suicide by hanging himself at his New Friends Colony residence in South Delhi reportedly due to financial problems. Khushal Raji, who recently suffered some financial setback and was depressed since then, was found hanging in his bathroom by his wife yesterday morning at their 'b' block, New Friends Colony residence, according to the police. He had gone to sleep in his room last night at about 11.30 pm and had locked his room from inside. The room was broken open this morning after there was no reply despite several calls. Raji was rushed to a private hospital where he was declared 'brought dead', after which the police was called at about 9.00 am yesterday. The gemologist, who has two sons--11 and 15 years of age, was undergoing treatment for depression, his family told the police. Additional Chief Metropolitan Magistrate Kamini Lau posted the matter for hearing the arguments for Tuesday after the investigating officer contended the police required time for filing its written submissions against Katara's bail application. The court directed the police to submit their reply by tomorrow. Meanwhile, Hyderabad-based travel agent Rasheed was today remanded in judicial custody till June 15 after expiry of his seven days' custodial interrogation. Earlier, moving an application, Katara's counsel had submitted the MP was not required for interrogation in the case. There was no probability that Katara would abscond as his passport had already been impounded by the police, counsel had argued. The court had, on June 6, refused to grant bail to three accused, Kiran Dhar, Sunder Lal Yadav and Satwant, in the human trafficking case involving Katara, saying that their release would have affect the probe as the police were yet to lay their hands on other suspected parliamentarians. Katara was arrested on April 18 from IGI Airport here while trying to take a woman, Paramjeet Kaur, and a 15-year-old boy on his wife and son's passport, respectively. The prospectus is most unclear on this essential ground and most applicants are confused as to where these courses are being offered. On the other hand, university authorities claim that enough publicity has been provided to these courses. However, INSO members feel that the prospectus that is supposed to carry information regarding the university is lacking consolidated information in many respects. The problem is most acute among applicants who come to DU from adjoining states. Amit Kaushik, the INSO president, informs, "The courses in which admission is through an entrance test have been mentioned in the prospectus on page no 13 but these courses are not mentioned in the OMR (Optical Mark Reader) or Preadmission form. No-where is it mentioned where one should go in case he or she wants to pursue some of these courses e.g. BE, BBS, BAMS, BHMS, BFA, BUMS, BPED, BDS and many more." Kaushik further says that, "all the 17 admission information centres were supposed to have been equipped with photocopy machines but such facility to assist students has not been provided. And most of the time volunteers of INSO show applicants the way to photocopy shop." The university had also committed a 'blunder' in the prospectus by stating that St. Stephen and Jesus and Mary College did not accept the common form which creates further confusion for already stressed applicants, he claimed. Amit Sahni, the INSO spokesperson, elaborates that, "We face the maximum queries about the availability of professional and vocational courses in DU." Also on the 27 per cent quota in DU for Other Backward Classes (OBC), the information bulletin only states that "The University and its colleges will abide by the directions of the Ministry of Human Resources and Development (MHRD) as and when received." However, the separate box for General and OBC candidates in the centralised pre-admission form creates confusion among students. The presence of a separate OBC box in the OMR form also raises questions in the mind of SC and ST candidates that will they have to share their part of reservation with OBC. So there is considerable confusion among students due to loopholes in the prospectus, the students claim. The INSO is demanding that at least an arrangement for photocopy should be made at every Admission Information Centre as students are bound to have Xerox of the OMR form before submission. It is totally unfair to move thousands of students from pillar to post just for having the photocopy. The INSO has made available four help-line numbers 9868708236, 9212513500, 9868407007, 9213663322 for the students who seek admission in DU. "The recent letter from the Delhi government to the principals of all the 100 per cent Delhi government funded colleges threatening not to officially release the second instalment of funds if the colleges do not get themselves accredited by the NAAC is a cause of serious concern," a DTF release said. "The Delhi government intends not only to bring disparity between the Colleges of Delhi University but it also attempts to destroy the autonomy of the University system by directly writing to the colleges and purposely creating multiple zones of authority," the release claimed. The DTF claims that there will be serious implications of implementing NAAC on the government-funded educational institutions. The NAAC was initially designed with the definite objective to address the significant issue of deterioration in the quality of higher education by controlling the mushrooming of educational institutions having substandard facilities and fancy programmes in the private sector. "Despite the substantial increase in the local population of Delhi in the last decade, not a single new college was added to Delhi University. Till recently, the University was facing the restriction of 85 per cent cap on the recruitment of teaching jobs. There is a complete ban on the recruitment of non-teaching jobs," the DTF claimed. "Many colleges are being run in the school buildings. There is a massive cut on the acceptable budgets of the colleges. The colleges are asked to generate their own funds. Very few new courses have been added in the last many years," it added. "In this situation asking the colleges to get them accredited by the NAAC obviously uncovers the malafide intention of Delhi government of stopping the funding of those colleges having low NAAC rank. It shows that the Delhi government and the UGC are shirking from their responsibility to spread higher education," the release said. A spokesman of the DFA said that the UGC committee on NAAC itself found that its earlier methodology was defective. Therefore, the new methodology is being adopted since April 2007. "The increase in public transport fares and fuel prices on Wednesday will further add burden on the salaried class, especially those travelling short distances", said Vijay Raghvan of the Mehrauli Federation of RWAs . "Now, I will think twice before boarding an autorickshaw and will consider walking short distances. Taxis now are out of the question", he added. "I have to shell out Rs 2 more for going and coming back for my classes from Karkardooma to Preet Vihar, with increase of Re 1," said Sourit Arora, going regularly for his tuition. "Increase in autorickshaw fares is bothering us more as we still do not expect autorickshaws to run by meter despite the increase," said S. P. Gupta of Old Rajender Nagar RWA. Sanjay Kaul of People's Action termed the increase in public transport, particularly in auto and taxi fares as "license to loot." The hike was "pandering to the transport cartels," he added. He expressed the apprehension that increase in power tariff may soon follow. He has categorically conveyed to the MCD that their action is not visible to the people and they have apprehensions the entire work of desilting of drains may not be completed by June 29, the expected date of arrival of the monsoon in Delhi. Dr Walia has been regularly reviewing the progress of desilting of drains being undertaken by the MCD and the Irrigation and Flood Control (IFC) Department. The minister today chaired a review meeting, which was attended by senior officers from the MCD and IFC Department. It was reported in the meeting the Irrigation and Flood Control Department had achieved 72 per cent of its target of desilting of 16 drains. It has assured the entire work would be completed by June 25. Out of the estimated 5,03,250 cubic meters of silt, 3,59,900 cubic meters has been removed by the IFC Department. The progress of work in respect of the MCD is not much satisfactory. Out of its 1265 drains, it has been able to clean only 96 drains whereas work is in progress in 553 drains. It has removed 86,589 metric tonnes of silt. Out of 1265 drains, 656 drains are to be cleaned by the contractors and the rest by the departmental force. The MCD has since started removing silt from those 157 drains which were transferred by the PWD last year. It has completed desilting in three drains whereas work is in progress in 31 drains. A total of 6,828 metric tonnes' silt has been removed from those drains which were transferred by the PWD. The minister has asked both the agencies to avoid accumulation of removed silt on the roadside, which may cause health problems. He has directed both the agencies to transport the removed silt to the dumping grounds without any delay. An itinerary for inspection of desilted drains have been prepared and Dr Walia would very soon start inspecting these drains to mount pressure on the MCD to further speed up the work. Dr Walia has further requested the railway authorities to expedite the construction of SSBL drain and start its desilting process. The Railways has also been instructed to start cleaning all culverts which are situated in its jurisdiction. The DMRC has been requested to take care of drains near Rohtak Road, drain number 12, Model Town, Kanhaiya Nagar Parking and Vikas Marg. "The children used to work in extremely inhuman and hazardous condition. They had been trafficked from Bihar and Uttar Pradesh. Most of them were brought here by luring to provide good wages. However, contrary to it, they had not been paid any thing so far," said an officer. The law officer of Delhi Prisons Sunil Gupta said that it was a long pending demand and this was a moral boosting decision. While the French tourist Lamia was admitted in a critical condition to Safdarjung Hospital with 95 per cent burns, her colleague from Ludhiana, Lissie Ahuja, was burnt in her hands and feet in the fire which took place yesterday at about 1 am in the night, the police said yesterday. The fire emanated from the ground floor of Hotel Regalia Inn in Chittaranjan Park where a party was on and spread to the first floor of the multi-storey hotel, engulfing several rooms in its sway. However, it was brought under control within half an hour with the help of six fire engines. He said ever since peace was restored at the instance of Gujjar leaders false cases were being registered against them and they were being picked up from their premises at night without any specific charges. The police have lodged an FIR against 11 persons under Sections 147, 149, 341, 186 of the IPC. District president of Indian National Lok Dal Aant Ram Tawar, Balbir Singh Boken, Hari Chand (ex-sarpanch), Nathu (ex-sarpanch), Subhash, Satpal, Sudhir, Hansa, Samey Singh (sarpanch), Satbir Pahlwan and Rakesh Kumar were booked for rioting, wrongful restraint and obstructing public servants in discharge of duty at public functions during the Gujjar unrest. The real reason behind lodging an FIR against these persons was that all these accused belong to the opposition party, the INLD, alleged Sukhbir Kataria, an INLD leader. Here, it may be recalled that independent MLA from Sohna, Sukhbir Jaunpuria, who is supporting the ruling party unconditionally, had come forward openly in support of the Gujjar movement. He along with his hundreds of supporters used to block the traffic daily at various roads during the agitation. Two more MLAs, Dharambir Gauba of the Congress from Gurgaon and Radhey Shyam Sharma (Independent) from Narnaul, Mahendergarh, also joined the Sohna MLA and organised a mahapanchayat at a government stadium. They burnt numerous effigies of the Rajasthan Chief Minister at different roads, putting government machinery out of order. But the police took no action against them and their supporters. BJP leaders, including Tej Pal Tawar and Subhash Tyagi and their supporters, also joined the agitators and took part in blocking the roads. But the local police did not book them for reasons best known to them, alleged Kataria. When contacted for comments, Sukhbir Jaunpuria said he had always tried his best to organise the agitation peacefully. He and his supporters never took the law in their hands. Rather, on the other hand, INLD activists created chaos in the city to derive political mileage out of the Gujjar episode, added Jaunpuria. 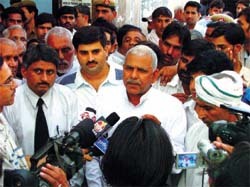 The Sohna MLA further added a number of MPs, MLAs and councillors of Delhi, UP, Haryana and Rajasthan decided today they would jointly plead before the Supreme Court to withdraw the cases against the persons who held the agitation peacefully. Action could be taken against the agitators who destroyed public property, added the MLA. The police role raised doubts as it lodged the FIR on May 31 and arrested the accused after the lapse of seven days on the night of June 7. Ten out of the 11 arrested persons got bail today. Senior Superintendent of Police Hanif Qureshi said the police was busy in controlling the protesters and that was why they were not arrested. For not taking action against MLA Sukhbir Jaunpuria and his other supporters, the SSP argued whenever the MLA along with his supporters used to block the roads, including NH-8, they unblocked the roads as soon as the police reached the spot. They were never adamant about keeping the roads blocked for a long time, said the SSP, adding that was why no action was taken against him and his supporters. However, the SSP seemed to have forgotten the Sohna MLA used to block different roads for two to three hours. The Gurgaon-Faridabad road where almost all windowpanes of a government bus were damaged near Gawal Pahri was also blocked by Sukhbir Jaunpuria and his supporters. Could the Supreme Court direct the Haryana Government to find the culprits who damaged public property and not adopt a pick-and-choose policy? The injured were rushed to local Khan and Madhu Nursing Homes where the condition of at least six injured passengers is still critical. Out of the 12 dead passengers, four persons have been identified so far. They were resident of Hapur. Efforts were being made to identify others, said a police officer. The accident happened when the bus, plying between Hapur and Bulandshahr, hit a tree after the driver lost control due to the brakes failing, said District Magistrate Ajay Shukla. The accident happened about 6 in the morning near Gang canal bridge on the Meerut- Bulandshahr route, Senior Superintendent of Police Deepak Ratan informed. Locals rendered a great help in rescuing the injured passengers, said the officer. An inquiry had been ordered into the accident, Shukla said, adding that the Uttar Pradesh Government would bear the medical expenses of the injured. The sources of power generation include 600 MW from the power plant at Yamunanagar presently under construction. About 300 MW of electricity would be provided by Chhatisgarh for which an agreement had already been inked, he said. Vidrohi claimed that the state government had been working overtime to ensure a smooth supply of power round the clock within the next two to three years when the total availalility of power was expected to go up from 4000 MW to around 10000 MW. By 2011, the total power availability in the state would be over 14000 MW and there would be no electricity shortage of any kind, he claimed. Blaming the previous governments for the power crisis, Vidrohi claimed that the power situation could not have worsened if the earlier governments had paid proper attention towards it and made efforts to raise the generation capacity. The HPCC spokesperson said the plant at Yamunanagar would start producing the first installment of 300 MW in February next year and this would go up to 600 MW by April next. Elaborating on the current power situation, he said the total availability of power at present had been 4039 MW which includes 3200 MW generated by various plants in the state, while the remaining was bought from other sources. Stating that while the government had been buying the power at a cost up to Rs seven per unit to meet the growing demand, he added that the total generation capacity of power within the state would go up by about 4500 MW in the next three years. Besides, the state government had made agreements with various states or suppliers to give another 3866 MW of power to be made available from 2009 to 2011. According to Vidrohi, the state would get about 300 MW of power from April next from Amarkantak in Chhatisgarh. It is also reported that the power department has announced to ensure a supply of at least 16 to 20 hours daily in rural areas from April, 2008 after the bifurcation process of the power supply infrastructure for rural areas will be completed. The government has allocated an amount of about Rs 585 crore for this work and it would separate the supply system of the domestic and non-domestic, including the agriculture sector in the villages. The work was likely to be over by December 2007, a senior official of the department said. "We will plant more trees in the forests and also create more forest area by utilising the wastelands," Delhi Chief Minister Sheila Dikshit said launching a tree plantation drive organised by Hotel Maurya of the ITC Welcome group here. She said 13-14 reserve forests have been developed in the Capital which will be made greener in the coming years. Dikshit said that the decline in groundwater level in certain areas of the Capital was alarming and the government was bringing a Bill to check the misuse of the resource. She urged the gathering to take up water harvesting to recharge the groundwater level. Dikshit, along with a group of school students, planted a few saplings in the Ridge area opposite the hotel and later visited the 'welcomenviron expo', an initiative launched by the hotel to promote greenery. The patience of the people over the issue of water and power supply seems to be fast diminishing. Residents of Chandhut village of Palwal subdivision blocked traffic on the Palwal-Aligarh road today in protest against the short supply of power and water. The blockade, which was lifted on the assurance of the authorities, was marked by violence as the mob pelted stones on officials trying to clear the road. A mild cane charge was resorted to by the police to disperse the people. At least 20 persons were booked by the police under various sections for indulging in violence. This is the second such incident in the district in the past three days. Hundreds of villagers staged a similar demonstration by blocking the traffic near Atali village of Ballabgarh subdivision on Wednesday. The protest here had also turned violent and resulted in damage to several officials' vehicles, including that of the SDM. The protest today started at about 11 am by residents of Chandhut as they blocked the road connecting Aligarh and Palwal. While the authorities reached the spot within half and hour, the situation turned ugly when some youths and the police clashed over the manner of protest. While the mob started pelting stones on the police and officials, the matter was brought under control soon after talks between the village elders and the police. The trouble ended an hour after an assurance was given to the people that power and water supply would be restored as soon a possible. However, the police registered cases under Sections 148, 149 332, 353, 186, 506 and 441 of the IPC against several persons. As many as eight of them were booked. The police also booked 24 persons for violence at Atali village on Wednesday. Meanwhile, in another development at Palwal town, members of the Joint Action Committee(JAC) of the workers' union of the Power Department staged a demonstration in Palwal today in protest against police inaction into the incident of holding hostage some employees of the Dakshin Haryana Bijli Vitran Nigam(DHBVN) by residents of a village about a week ago. The employees demanded action against the culprits who, they said, had taken the law into their hands and had stopped the government employees from discharging their duty. They also sought security for the employees from such elements. Although the power and water supply had been erratic since the onset of winter, the problem has exacerbated in the past seven days. Strangely, the residents of DLF City, considered to be one of the top end habitation areas in the National Capital Region (NCR), do not know where to put the blame for power and water problem. The DLF Management, the floater and builder of the DLF City, claims that it is the responsibility of the state government, while when the power department was approached the authorities said the DLF management was the right authority to be contacted on this issue. The general secretary of the DLF Qutub Enclave Residents Welfare Association Sundeep Virrmaani says that as far as the maintenance part goes the DLF Management does come to the help of the residents. "But the government was not taking its responsibility to provide adequate supply of water and electricity. The residents of DLF and other parts of Gurgaon city are approaching the local MLA of the ruling party, Dharamveer Gauba. In private, he says that he does not have any say in the functioning of the government. For the record, however, he says that there are 'technical failures', which are being rectified. The personnel in the power utility say that there is all round shortage of power and best efforts are being done, including rationing the available power. An elderly housewife staying in DLF, V.K. Chopra laments that for the past seven days, the residents were not getting power for more than 10 hours. As there was shortage of power, the residents cannot run their water motors. A couple of residents said that they had been spending some time after work hours in their air-conditioned cars to get respite from heat as even the invertors in their houses lose their function as the batteries cannot be re-charged due to long spell of load shedding. With regard to power situation, the residents in DLF City as well as other areas are buffeted with two-pronged problem. The cut imposed by the department and the cut caused by low voltage due to overloading of the transformers. There is always a danger of massive damage to the transformers in the two sub-stations feeding DLF City due to high intensity overload. A section of the residents are to be blamed for the overloading problem as they have affixed electronic gadgettes and used appliances which consume power more than sanctioned for the houses. But, according to the residents, the government and the management did not visualise the problem before hand. The gravity of the problem could be fathomed from the fact that a good percentage of the plots in the plotted area of DLF City have yet not been occupied. As power problem continues to mount so does water problem whose supply is based on power. Residents allege that either they have to resort to private tankers who are now on the black market and purchase of distilled water even for the basic needs. A number of residents also alleged that the DLF Management have illegally constructed a number of corporate office buildings at the sites meant for their community living and facilities. These office buildings consume huge amount of power and water which are being diverted from the quota meant for the houses.